Adventure was always in her blood. From being a pirate captain’s daughter to becoming the Caribbean’s first female pirate captain herself; Morgane Castillo was never going to lead a boring life! 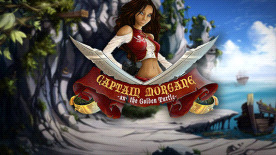 Join Morgane as she grows up from an innocent 8 year old island girl to becoming the most famous pirate of the Caribbean! Join her in her adventure as she seeks out the mysterious treasure of the Golden Turtle and help her solve the mysteries, puzzles, clues and outwit her enemies along the way. Help her recruit her crew, explore over 50 locations on 5 beautiful and exotic islands in the Caribbean sea but above all, try to keep her out of trouble…she is a pirate after all!